Most forms of gambling are legal and regulated in Finland. Finnish gamblers have access to sports betting, casino gambling and lotteries. However, both the online and the land-based gambling market is heavily regulated and monopolised. Domestic gambling activities in Finland are organized by 3+1 companies, each with a monopoly in its own area, and each owned in a large part by the Finnish government. The company Fintoto is in charge of horse race betting. All other forms of sports betting are in the hands of Veikkaus. This company also controls lottery games, including games such as keno and bingo. Casino gambling, which includes both slot machines and table games, is the monopoly of RAY. The “+1” gambling operator in France is PAF, which is, by itself, responsible for all forms of gambling on the Åland Islands, an autonomous region of Finland. Online gambling is also legal in Finland. Practically the same rules apply as to brick and mortar gambling, insofar as the only domestic companies who may legally offer gambling services within Finland are the previously mentioned operators. Finland is a member of the European Union, which is generally disdainful of gambling monopolies within its member states. Finland has long since insisted that all gambling within the country is non-profit, though this subject is rather controversial. Currently the monopolies still exist. International gambling sites are forbidden to advertise within the country, though there are no laws banning Finnish gamblers from playing on international online gambling sites*. Casino gambling in Finland is legal, but tightly regulated. Casino gambling, which includes both slot machines and table games is the monopoly of RAY within mainland Finland. On the Åland Islands the market is controlled by PAF. 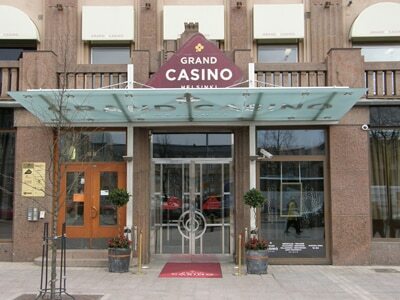 There is a single large casino in Finland, called the Grand Casino Helsinki. The casino is located in the capital, and hosts several games including poker, blackjack, roulette, punto banco and slot machines. The Grand Casino Helsinki also hosts a sports bar, where people can bet on sports games. Apart from this establishment, there are also several smaller casino venues and slot machine halls where people can play. The largest casino on the Åland Islands is Casino Arkipalego. Online gambling services are also offered by the companies that monopolise the market. RAY offers all of the games available in their brick and mortar casinos online as well. PAF also hosts an online casino, which is available to all Finnish gamblers. This has led to several conflicts between the two companies. It is illegal for companies without a licence to offer online gambling services within Finland, and no licences are issued but to these 4 companies. However, most international online casinos are available from Finland, and there are no laws against locals accessing them. All legal gambling in Finland is divided between 4 large gambling companies, and bingo is no exception. When it comes to online bingo, games are available on the website of Veikkaus. It is illegal for any companies without a licence to operate online bingo games within Finland, and only 4 domestic companies have gambling licences. However, as mentioned before, international online bingo sites are available from Finland, and there are no laws against locals accessing them. Poker is legal in Finland, and belongs to the category of casino games, overseen by RAY on the mainland and PAF on the Åland Islands. Though poker has become one of the most popular forms of gambling in Finland, currently only the two largest casinos, Grand Casino Helsinki and Arkipalego cater to poker players. Online poker is also legally available within the country. It may only be conducted by the monopoly in charge of brick and mortar poker, RAY, as well as PAF. Apart from these, there are no licensed online poker sites in Finland, though many international sites are available to local players. Sports betting is legal in Finland, and is covered by 3 of the large gambling companies of Finland. As usual, PAF covers the Åland Islands. Fintoto is in charge of horse race betting, while wagering on other sports is possible with Veikkaus. Horse racing has traditionally been the Finns’ favorite sport to bet on, though recently football has come to rival and even overtake it. Online sports betting is also available in Finland, through the respective websites of each gambling giant. Apart from them, there are no online sportsbook s licensed within Finland. However, most international online sports betting sites are available from Finland, and there are no laws preventing local gamblers from wagering on them. Lottery is also legal in Finland. In theory, various companies could apply for and receive a permit for operating lottery games. However, in practice, this too is a monopoly. Lottery is in the hands of the company Veikkaus. Games on offer include traditional lottery as well as games like joker, keno and bingo. Veikkaus also offers online access to their lottery games through their website. It is technically illegal for companies not licensed in Finland to offer their services within the country. However, several international online lottery sites are available to Finnish players. Bitcoin is legal to use in Finland, and Bitcoins are considered payment instruments, therefore VAT exempt. The cryptocurrency enjoys rather widespread use within the country, with several “Bitcoin ATMs” and stores accepting it. Bitcoin casinos are not specifically regulated by Finnish gambling laws. In Finland only companies with gambling licences may provide gambling services, and currently there are no licensed Bitcoin casinos in the country. Still, international Bitcoin casinos may be available to local gamblers.